Every year, the MPAA tries desperately to stop Oscar screeners — the review copies sent to Academy voters — from leaking online. And every year, teenage boys battling for street cred always seem to defeat whatever obstacles Hollywood throws at them. For the last 10 years, I’ve tracked the online distribution of Oscar-nominated films, going back to 2003. Using a number of sources (see below for methodology), I’ve compiled a massive spreadsheet, now updated to include 310 films. This year, for the first time, I’m calling it: after three years of declines, the MPAA seems to be winning the battle to stop screener leaks. But why? A record 37 films were nominated this year, and the studios sent out screeners for all but four of them. But, so far, only eight of those 33 screeners have leaked online, a record low that continues the downward trend from last year. They may be winning the battle, but they’ve lost the war. While screeners declined in popularity, 34 of the nominated films (92 percent) were leaked online by nomination day, with 25 of them available as high-quality DVD or Blu-ray rips. Only three films — Extremely Loud & Incredibly Close, My Week with Marilyn and W.E. — haven’t leaked online in any form (yet!). If the goal of blocking leaks is to keep the films off the internet, then the MPAA still has a long way to go. There are a number of theories about what’s causing the decline. It could be attributed to tighter controls — personalized watermarks, the aggressive prosecution of leakers, and greater awareness of the risks for Academy voters. 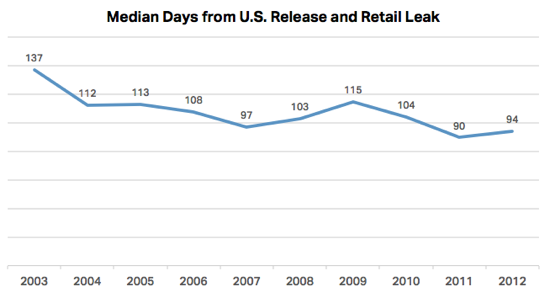 But the MPAA may have little to do with the decline. Oscar-nominated films could be coming out earlier in the year, making screeners less important. The continuously shrinking window between theatrical and retail releases may be to blame. After all, once the retail Blu-ray or DVD is released, there’s no reason for pirate groups to release a lower-quality watermarked screener. 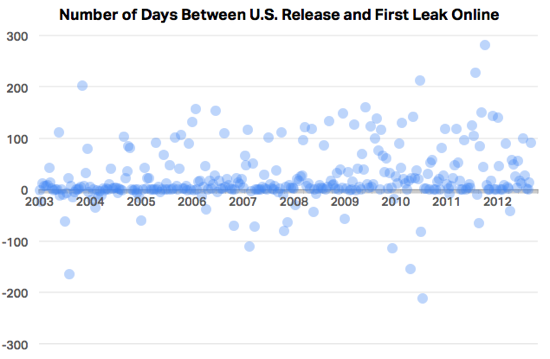 The chart below tracks the window between U.S. release and its first DVD/Blu-Ray leak online, which shows how the window between theatrical and retail release dates is slowly closing since 2003. Whatever the reason, online movie releasing groups are taking longer to pirate movies than ever. 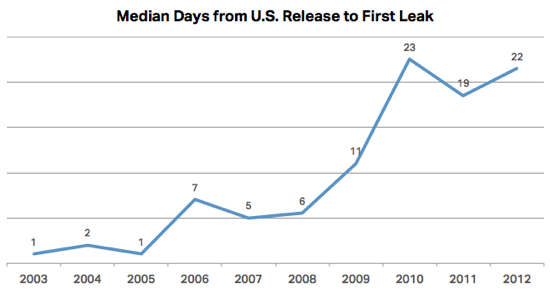 When I first started tracking releases in the early- to mid-2000s, the median time between theatrical release to its first leak online was 1 to 2 days. Now, that number’s crept up to over three weeks. As the industry slowly transitions from physical media to streaming video, it’ll be interesting to see if the downward trend continues, or if the ease of capturing streaming video spawns a new renaissance for screeners. Last year, Fox Searchlight distributed screeners with iTunes, and all were quickly and easily pirated. Skeptical of my results? Want to dig into it yourself? Good! Here’s the complete dataset, available on Google Spreadsheets or downloadable as an Excel spreadsheet or comma-separated text file. I include the full-length feature films in every category except documentary and foreign films (even music, makeup, and costume design). I use Yahoo! Movies for the release dates, always using the first available U.S. date, even if it was a limited release, falling back to the first available U.S. date in IMDB. All the cam, telesync, and screener leak dates are taken from VCD Quality, supplemented by dates in ORLYDB. I always use the first leak date, excluding unviewable or incomplete nuked releases. The official screener release dates are from Academy member Ken Rudolph, who kindly lists the dates he receives each screener on his personal homepage. Thanks again, Ken! For previous years, see 2004, 2005, 2007, 2008 (part 1 and part 2), 2009, 2010, and 2011. You might be able to test the arthouse theory by plugging some box office totals into this — maybe per-theater sales for opening weekend would be a crude measure of popularity? Excellent study, very fluid and complete. I would agree with your statement “…maybe the interests between the mainstream downloader and industry favorites is diverging…”, I mean, let’s face it, each time a group releases a title, the members take a risk. If the film itself is not worth the time or effort, why take the risk? As for the lag in release times, this is due to the material source(s) more than anything else. Currently, most TS’s use a russian grp video source, and sync it to an english capped audio track (usually capped with an mp3 recorder either at the drive in over the air broadcast, or through the headphone jack of a seat in a theater). Either way, the availability of both sources has to be there for it to come together. While the Russian video may be available for a week or two, an english audio source may not be (if the delay is long enough, some grps will sync a crap cam audio track to the good Russian video). Once someone caps the direct audio, the english TS is released. Back in the early days, video and audio were capped domestically, and you might see a good TS the day after the movie was released in theaters. These days, with security in the theater and the risk of losing your HD camera to confiscation or even doing time, no one wants to take that chance. So, by extension, the MPAA HAS made a small impact by pushing stronger legislation, which has resulted in more security…but ultimately it just slowed the release times. In the end, the groups will always find a way. Watermarks, serial numbers…all of those can be easily discarded by transcoding the video to another format and blurring any onscreen telltale signs. High quality TS sources are now imported through multinational private p2p, capped in countries where the MPAA has no reach. They are stored on private servers all over Europe, accessed by members all over the world, and the final releases are distributed through FTP, usenet and torrent from around the globe to anywhere a user can access. But Google Docs? Come on, BuzzData is where these datasets should live (and live on in other projects). Anyhow, I’m curious whether the degree to which something is pirated (or the time it is available as a screener) has any predictive correlation with the ultimate winners of the award. Movies would be a such more relaxed affair if it wasn’t for the huge amounts of money involved in the purchase of the final product. I am confused…have you checked the private p2p sites lately? They even have the screeners you can’t seem to find on them. I really love these statistics you make. But please update the data. There are some releasedates missing. hi, i have 2 screeners, one from the emmys marked 2002; & one from the oscars marked 1991. is it ok to sell these since they r so old? I never heard of this b4 til i saw markings on these old videotapes (I dont own a dvd player)& thats how i came across your article. (& a few more).One of the articles they said they quit the academy due to this problem & he got (imo)very paranoid. if they r old like these & its legal to sell them could it increase the value? Im not a techie so dont know how to make copies nor doubt i even would; im just trying to sell a bunch of old things & those were in there. thanku! Mirror Mirror was released in US March 30th, not May 30th. So the leak was not so early compared to release. Can you confirm a leak of Les Miserables on November 25th? This is interesting compared to the premiere (in the UK) which seems to have been December 5th (and release in the US indeed December 25th). I applaud your research. It’s quite compelling. However, there is one error: In your “The Data Dump” section, the very first title, “Amour” is listed as a screener not being available by Oscar night.. However, I definitely remember watching this movie before the broadcast. Perhaps this Data Dump was created before the actual Oscar Night event aired? In any case, all of the data and statistics contained on this page is amazing, and I applaud you for your hard work. Correct! I usually update the day that nominations are first announced. I updated the spreadsheet and added that screener in.